Authors: Virginia L. Tice serves as CEO of the Fertile Crescent Foundation, an environmental non-profit organization that works throughout the Middle East. She also works as a legal consultant to governments, international organizations, and private companies on water and environmental issues. Peer Reviewer: Paolo Mastrocola is a water resources management engineer. He has been working in Iraq for the last 10 years providing consultancy services to both governmental and non governmental organizations. The climate in Iraq varies. Although the climate throughout most of the country is subtropical semi-arid, the north and north-eastern mountainous regions have a Mediterranean climate. Rainfall is seasonal, mostly falling from December to April, and varies from 1200mm/year in the north-east to less than 100mm/year over 60% of the country in the south. Winters are short and cool, with a day temperature of about 16°C, dropping at night to 2°C. Summers are dry and hot, with a shade temperature of over 43°C during July and August, yet dropping at night to 26°C. Map 1 : Precipitation in Iraq. The population in Iraq as of 2015 was a little over 37 million. With the median age of about 20 years old, it is a relatively young country. It is also a fast-growing one: the population has increased several times over since 1950 and, with a current growth rate of about 3%, is projected to add another million people a year for the next 20 years. Urban areas in particular are expected to grow significantly during the next two decades, which will increase the municipal water needed for household and non-household uses. Daily water consumption, for example, is estimated to range from 132 to 240 litres per capita in rural and urban settings, respectively, the provision of which will be a significant challenge. Most of the country (approximately 70%) lives in urban areas, as people have left rural villages in search of employment and essential services like health care and education. The annual rate of urbanization from 2010 to 2015 was 3%, which is a significant migration of people. City sewer systems and wastewater treatment plants as well as other governmental services like power generation have struggled to keep up with the influx of residents into major urban areas. In the Kurdistan Region in northern Iraq, an additional strain on governmental services has been the recent entry of hundreds of thousands of Syrian refugees. Refugee camps in Duhok, Erbil and Sulaymaniyah house almost 250,000 registered refugees, and an untold number of unregistered ones. According to the World Bank report Economic and Social Impact Assessment of the Syrian Conflict and ISIS Crisis, the stabilization cost for 2015 is estimated at $1.4 billion in additional spending above and beyond the Kurdistan Regional Government (KRG) budget. Iraq’s economy is dominated by the oil sector, which provides more than 90% of government revenue but less than 1% of employment. The country’s main employer is the Iraqi government, which employs over 40% of the population. The unemployment rate has fluctuated greatly over the past 15 years, from an all-time high of 28% in 2003 to a record low of 15% in 2013. Food and Agriculture Organization, 2008. Irrigation in the Middle East Region in Figures – Aquastat Survey. Available at www.fao.org/nr/water/aquastat/countries_regions/irq/IRQ-CP_eng.pdf, accessed 6 June 2016. Tara Mohamed Anwar Omer, Food and Agriculture Organization, 2011. Country Pasture/Forage Resource Profile: Iraq. Available at www.fao.org/ag/agp/agpc/doc/counprof/iraq/iraq.html, accessed 6 June 2016. Central Intelligence Agency of the United States World Factbook, 2016. Iraq Country Profile. Available at www.cia.gov/library/publications/the-world-factbook/geos/iz.html, accessed 6 June 2016. Ministry of Water Resources of Iraq, 2014. 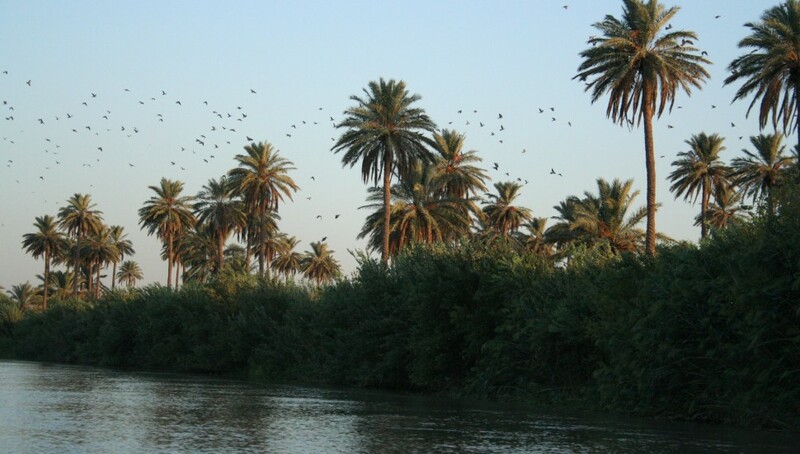 Strategy for Water and Land Resources of Iraq 2015-2035. Some ministries in Iraq have stated an even higher per capita water need of 350lpcd. See, e.g., Ministry of Municipalities and Public Works, General Directorate for Water. 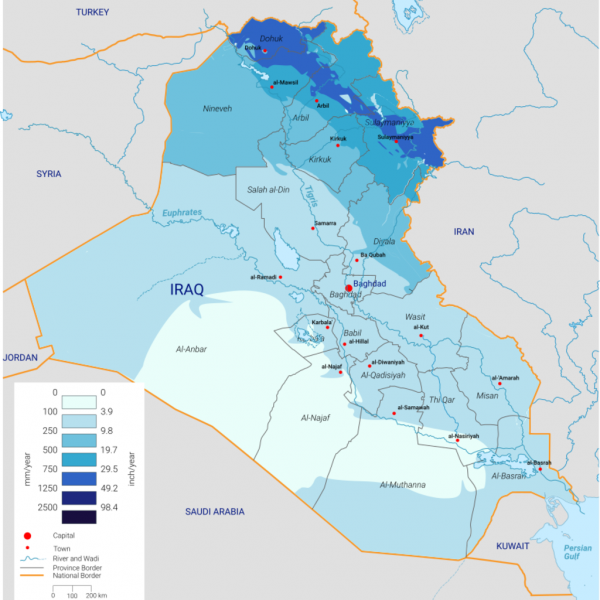 Water Demand and Supply in Iraq: Vision, Approach and Efforts. Available at http://marshlands.unep.or.jp/includes/file.asp?site=marshlands&file=7380F6CA-C9DB-4E83-8372-0B3B8A5C5207, accessed 6 June 2016. Several protests have been held to complain about the lack of basic services. See, e.g., Reuters, 2011. ‘Iraqis demonstrate over lack of basic services’. Available at www.reuters.com/article/us-iraq-protests-idUSTRE7151B020110206, accessed 6 June 2016. Syria Refugee Regional Response, 2016. Available at data.unhcr.org/syrianrefugees/country.php?id=103, accessed 6 June 2016. Stabilization cost refers to the additional spending that would be needed to restore the welfare of residents of the Kurdistan Region of Iraq. The World Bank, 2015. ‘The Kurdistan Region of Iraq Needs an Estimated US$1.4 Billion this Year to Stabilize the Economy’. Available at www.worldbank.org/en/news/press-release/2015/02/12/kurdistan-region-iraq-stabilize-economy, accessed 6 June 2016. United Nations Development Programme, 2015. ‘About Iraq’. Available at www.iq.undp.org/content/iraq/en/home/countryinfo.html, accessed 6 June 2016. Trading Economics, 2016. ‘Iraq Unemployment Rate’. Available at www.tradingeconomics.com/iraq/unemployment-rate, accessed 6 June 2016. The World Bank. Country Profile: Iraq. Available at data.worldbank.org/country/iraq, accessed 6 June 2016.